Part of a chain of Italian restaurants, this branch is in More London near City Hall and Tower Bridge. secretlondon visited with some colleagues for a work Christmas lunch in December 2008. I had the set Christmas menu for £25. The service was confused. It took an hour for us to be given our starters and people had trays of antipasti for four people placed in front of them without any consideration of who had ordered which starter, or even being told how many the starter was meant for. The sea bass main course was different depending on whether a person had chosen from the set or a la carte menu. Our waitress didn't check who had ordered from which menu. However in their defence the restaurant was full and it was Christmas. The food was fine - it was just let down by chaotic service. The views of Tower Bridge and the river are spectacular. 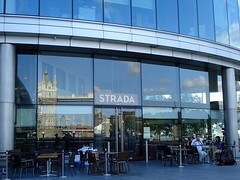 Accessibility: The Strada website says that this branch has step-free access and an accessible toilet. secretlondon noted stairs to enter and the toilets were upstairs. We couldn't find a toilet on the same level as the restaurant. Last visited by secretlondon and colleagues, December 2008. Last edited 2009-06-01 00:41:37 (version 9; diff). List all versions. Page last edited 2009-06-01 00:41:37 (version 9).